I should first of all declare: I am musically illiterate. Though I do enjoy listening to classical music and have on occasion been to a concert or two, my understanding of and ability to talk about the music itself is virtually non-existent. Which is precisely why I picked up this book when it was on offer. Purporting to be “an accessible guide” and advertising itself as “the place to start” when wishing to learn a bit more about the symphonic form, this book seemed perfect for someone like me, who would be likely to listen in to the BBC Proms but very unlikely to turn up and get his hands on the programme. In the introduction, Nicholas Kenyon explains that this book was designed to provide the information prepared for the programme notes produced for the Proms to a much wider audience of music lovers. As a first volume (Kenyon hints there might be more) they have stuck to the more mainstream pieces in the repertory, and the choices are perfectly reasonable: whilst the selection won’t please everyone, the usual suspects are all present and correct, no doubt covering most of the bases for a typical Proms season. Each symphony summary is designed to be read on its own, with each composer given a little introduction beforehand. On the whole, the form works nicely, with the majority of the nearly three dozen contributors producing very concise pieces packed with historical details, personal motivations and an overview of the music itself. There are just over 100 symphonies from nearly 30 composers described here, which should mean a little something for everyone’s tastes. Sadly, there are some things which detract from making this guide wholly recommendable. The composers are listed alphabetically, which I couldn’t help but feel was the least helpful order they could have chosen. The introduction could have been a little longer, and given more of an overview of the development of the symphony as a recognised form, though this is just a personal gripe. Whilst the introduction admits that there may be some repetition, each summary designed to be readable independently, it nevertheless made skimming through the book rather tedious at times. As I decided to read the full section on Haydn, for example, I think I read the history and reasoning behind the naming of his London symphonies 3-4 times, and given that this introduction might take up half a page out of a 2-3 page summary, it’s clear just how much space is almost tangibly wasted. Far more of a blot on the book, however, was the fact that some summaries were probably more dense to read than the music itself is to listen to. Whilst the best contributors could condense a short history of the composer and his period, as well as an elucidation of a symphony’s movements and peculiarities all within a couple of pages, others might ramble on for four or five pages of what I found to be unfathomable description riddled with unexplained musical terminology. Particularly galling if that happens to be a favoured piece. And whilst the German time-markings of Mahler’s symphonies, for example, would be helpfully translated, all Italian was reproduced verbatim without even a glossary for us illiterati. In summary, a bit hit and miss. For casual listeners and people interested in the history and workings of the symphonies and their composers, it certainly is a reasonable place to start, at least if you don’t buy the book for those symphonies finding themselves in particularly sticky chapters. I imagine that my feelings about the book have been coloured somewhat by their inclusion, and that there are in fact many more ‘good’ summaries than ‘bad’ ones, but they do sadly leave the book only recommendable with reservation. For a guide to the composers themselves, however, I can wholeheartedly recommend The Lives of the Great Composers. 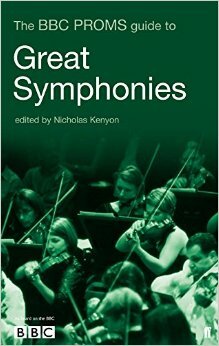 Whilst not at all focussed on their symphonies, the book does give a excellent introduction to many if not all of the great composers on that list, placing them in historical context and describing their contributions to the great classical music lineage.